Important early map illustrating the explorations of La Verendrye and the River of the West. Carte de L'Amerique Septentrionale Pour servir a L'Histoire de la Nouvelle France. An important and influential first edition first state 1743 map of the North America by the French cartographer Jacques-Nicholas Bellin. 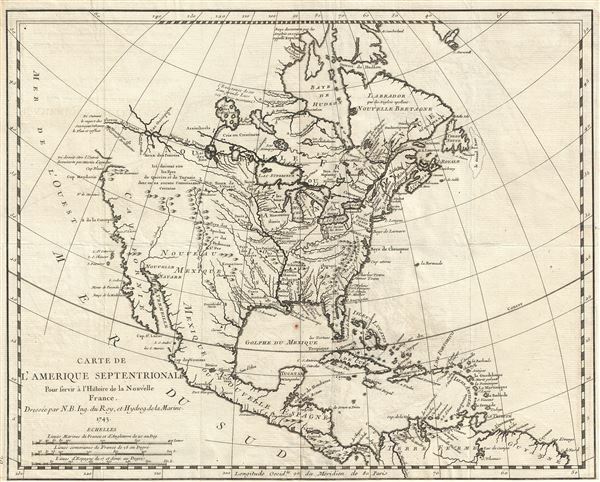 Bellin's map covers all of North America from the Arctic to the Spanish Main, including modern day Canada, the United States, Mexico, Central America, and the West Indies. The map features several interesting annotations throughout. These include, among other interesting notes, a comment pointing out the dubious existence of Quiviara and Teguaio, mythical undiscovered cities of gold sought since the days of the Conquistadores. By far this map's most striking feature is the broad open water route extending westward from Lake Superior, through the Lake of the Woods (Lac des Bois), and continuing via the River of the West (Fleuve de L'Ouest) through Lake Winnipeg (Ouinipigon) to the mysterious Mountain of Radiant Stones (Montagne de Pierres Brillantes). This unusual presentation of the American west is based upon Bellin's extrapolations from the explorations of French Canadian fur trader and explorer Pierre Gaultier de Varennes, Le Sieur de La Verendrye. This river system is based heavily upon a canoe map drawn for La Verendrye in 1728 by the American Indian Cree guide Auchagah. The ultimate westernmost point on this map, near the Mountain of Radiant Stones, is in fact still several thousand miles from the Pacific. Bellin's error here comes from his attempts to extrapolate from the distances, direction, and portages illustrated on Auchagah's map compounded by a lack of surveyed points west of the Lake of the Woods. The result is a double mapping of Lake Winnipeg and a vast overestimation of the distance represented. The 'Montagne de Pierres Brillantes' are an early American Indian descriptive term for the Rocky Mountains, a near impenetrable barrier located about 1200 miles further east than Bellin's map suggests. Bellin's map is a profoundly French production indicative of both the sophistication of 18th century French cartography and influence of French political ideologies on mapmaking. The map centers on the Mississippi with French territory extending from the Appellation Mountains to the Rio del Nord (Rio Grande), including all of Texas and parts of modern day New Mexico - claims associated with La Salle's explorations and colonization of the Gulf Coast in 1685 (these claims, incidentally, led to 19th century U.S. Claims on Texas associated with the Louisiana's Purchase). Detailed identification of numerous American Indian nations and settlements throughout the territory, mostly along known river courses, further illustrate France's paternal and comparatively peaceable approach to New World Indian relations, commerce, and colonization. The contrast is partially noteworthy with regard to the English territories to the East of the Appellation Mountains, and the Spanish Nouveau Mexique where few American Indian settlements are noted. Just 11 years after Bellin drew this map these and other tensions would eventually devolve into the 1754-1763 French and Indian War. Charlevoix's history and this map in particular thus proved exceptionally influential as one of the most comprehensive works on North America predating the French and Indian War. Copies of the Histoire et description generale were to be found in the libraries of many 18th century luminaries, including Voltaire, Franklin, and Jefferson. Jefferson in particular admired Charlevoix work, calling it 'a particularly useful species of reading' and no doubt influenced his decision to pursue the historic 1802 Louisiana Purchase, possibly the most significant event in the post-colonial history of North America. Charlevoix, Pierre François Xavier de, Histoire et description generale de la Nouvelle France, avec le journal historique d'un voyage fait par ordre du roi dans l'Amérique septentrionnale, (Paris: Chez Rollin) 1744. Very good. Sharp early impression. Margins narrow as issued. Platemark visible. Blank on verso. Original fold lines exhibit minor wear. Tooley, R. V., Map Collectors Circle, vol. 96] #692. McGuirk, D., The Last Great Cartographic Myth: Mer de L'Ouest, no. 13. Wagner, H. R., The Cartography of the Northwest Coast of America To the Year 1800, #544. Wheat, C. I., Mapping of the Transmississippi West, 1540 – 1861, #120, p. 70 - 71. Paullin and Wright, Atlas of the Historical Geography of the United States, Plate 23C.